Why? The nerves in the thoracic (chest and abdominal) region of the spine control digestion. If the thoracic vertebrae are out of alignment, these nerves become irritated. This irritation will make them send erratic impulses to the stomach and intestines, which will lead to digestive problems such as constipation, bloating, and excess gas. When the thoracic spine is put back into proper alignment, it allows the attached muscles and nerves to release the tension they may be holding. This release of tension can help alleviate digestive problems. 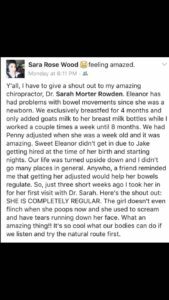 A simple adjustment(s) can help eliminate these issues, as commented on by Sara, a mom to Eleanor (almost 1 years old), who came in to see Dr. Sarah Rowden with irregular bowels. Chiropractic care has been shown to reduce inflammation in the body and promote healing. Misalignment can also prevent proper digestion. If you are experiencing digestive issues, give us a call. 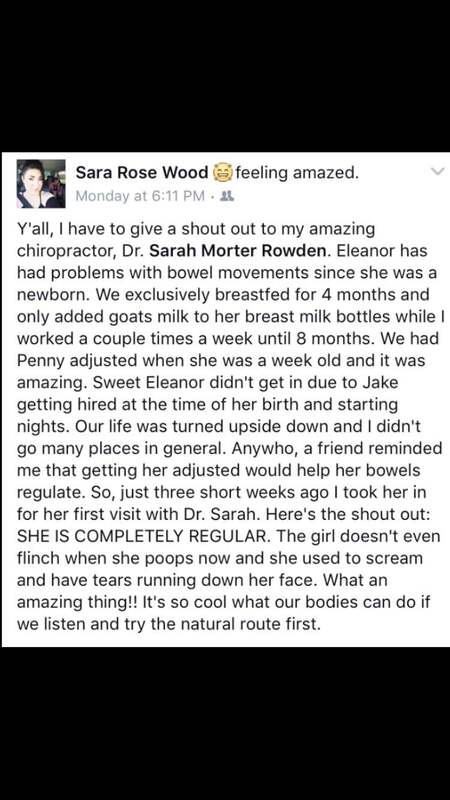 We can schedule you to meet with Dr. Josh or Dr. Sarah and get to the root of your problems. 479-636-1324.